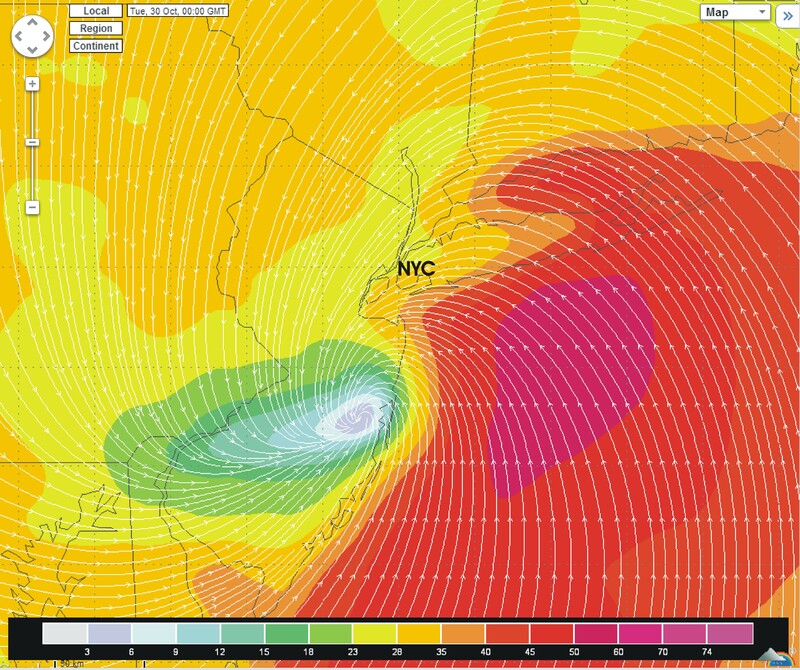 Wind forecast (scale in knots) for 7pm Monday, from NOAA’s North American Mesoscale (NAM) model, showing winds blowing into NY Harbor at 45-55mph (red color) and even 55-65mph (magenta). The eye of the storm is the region with weak winds (white). (created with the Weather Underground map tool). 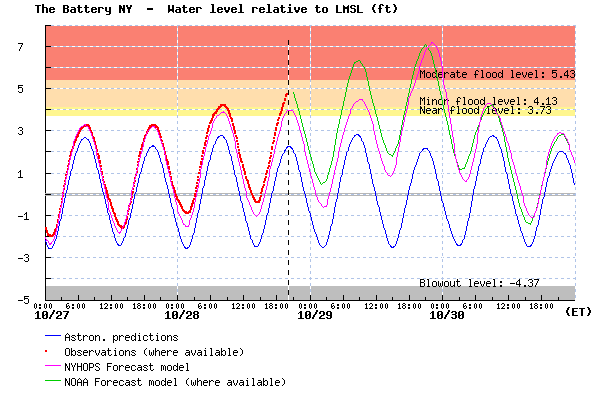 Sandy’s storm surge for New York Harbor is almost definitely going to be worse than Irene’s, and it is likely to cause several feet higher flooding. There is a good chance (about 50%) that flood elevations at Manhattan and nearby New Jersey will be the worst in 80 years of measurements, and if so, then likely the worst since the devastating 1821 hurricane. 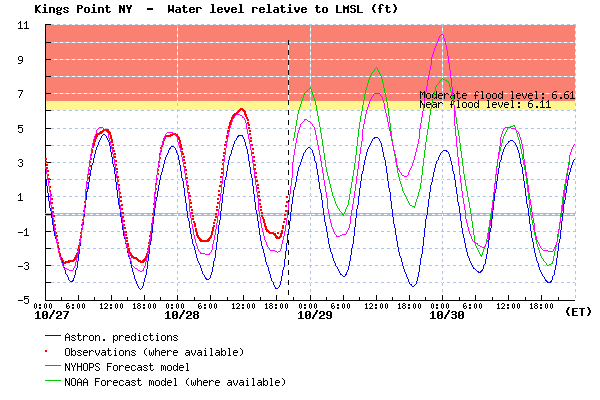 Strong uncertainty exists, in part because the timing of the flood relative to high tide can make all the difference. Some flooding will come with high tide as early as Monday morning, but the worst is expected at the next high tide on Monday evening, and another wave of flooding may come Tuesday morning. The storm forecast has shown little change today — it is expected to make landfall as an extra-tropical storm similar to a very large Category 1 hurricane with maximum winds of about 70-80 mph, running a northwestward course over the middle of the New Jersey coast. The latest weather guidance suggests it may make landfall at high tide on the Jersey Shore, another “worst case” factor for that area as well as New York City, where high tide is 8:53 pm. This storm will be very large, and strong onshore winds of over 50 mph will likely extend hundreds of miles off toward “the right of the storm” as its center makes landfall. This suggests widespread flood impacts, not only localized impacts near the center of the storm. 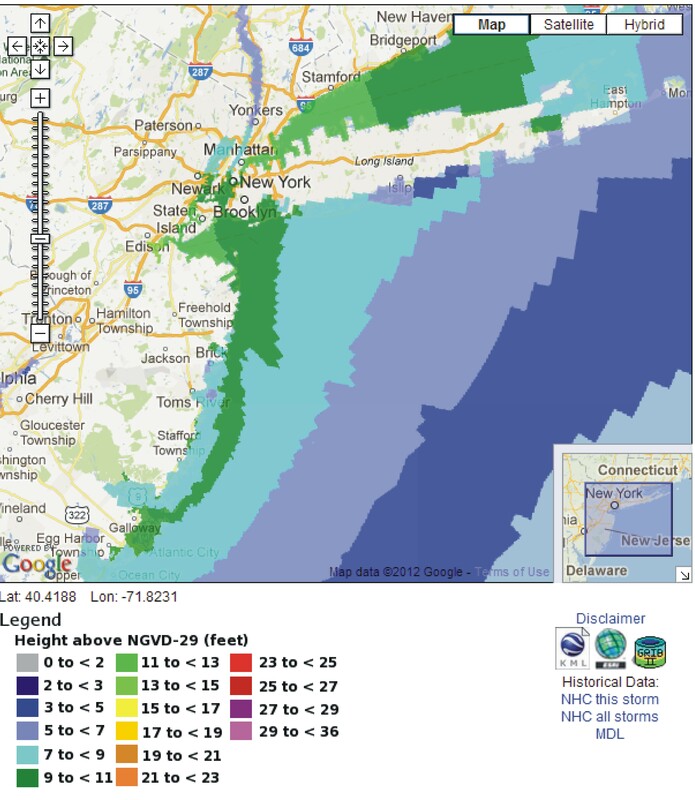 The NYHOPS Storm Surge Warning System forecast for the NY/NJ Harbor and New York City region has been for Sandy’s coastal flood height to be similar to or a few feet higher than Irene, which itself flooded into the city’s low-lying neighborhoods. (However, if you prefer REALLY scary stories, take heed of the 10% likelihood flood forecast I describe further below, if you want to know what is a sort-of a “worst-case scenario”). Stevens NYHOPS Storm Surge Warning System forecast for water levels at The Battery (magenta), relative to mean sea level (LMSL – NOTE THIS IS A CHANGE FROM PRIOR PLOTS). Predicted tides are also shown (blue), as well as observed water levels and the NOAA ET-Surge forecast for comparison (green). Above is a figure showing the NYHOPS and NOAA forecasts for Battery Park — the New York/ New Jersey Harbor region – 7.1 ft above mean sea level. This is about 1-2 ft above some low seawalls around the city; a few inches higher than Irene’s flood level. The surge doesn’t coincide with the high tide in this forecast, but if the storm comes a few hours earlier, then the total water level will be a few feet higher. Above is the forecast for Kings Point and other areas in Western Long Island Sound and the eastern end of East River (e.g. Flushing) – 10.4 ft above local mean sea level; this is roughly 2.5 ft ABOVE Irene’s flood elevations. For a good estimate of a “worst-case scenario” total water elevation, add this to the high tide elevation, but subtract 1 ft because they use an old height datum (NGVD29) and that is close to a foot below mean sea level. In this case you get a total of about 11.5 ft above mean sea level for The Battery, or 13 ft for Kings Point, both shattering existing records and sending water 5-6 ft above seawalls and deep into the city’s neighborhoods (beyond Evacuation Zone A). It concerns me greatly that I’m hearing of people ignoring evacuations, and I’m seeing apartments on my street that are below sidewalk level that aren’t in the evacuation zone. The sidewalks are about 10 ft above mean sea level, so there is the potential for some people to get waterfalls of endless ocean water coming into their homes tomorrow evening. Look out for your neighbors, and spread the word about what the flood forecast means in your low-lying neighborhood! This entry was posted in water, weather and tagged evacuation, forecast, Frankenstorm, gale, harbor, hurricane, long island, Long Island Sound, new jersey, New York City, predicted, Sandy, seawall, storm surge, storm tide, tide, total water elevation, wind. Bookmark the permalink.